So amazing but they want to remove me because I do not promote product Ultimaker. Sorry for the confusion and success. First Layers problems (thin, not stick, etc) - Tried several solutions without success. You can also print on a cold table PLA and similar materials. The first layer need not be perfectly adhere to the table and does not need to be closed door. Simply use glue to 3D printing PROGLU3D PLA-cold, the adhesive solves most of the problems of deflection, warping and detachment a printout from the table. Of course you need to level the table and improve print settings but you do not have a heated table and really save money. 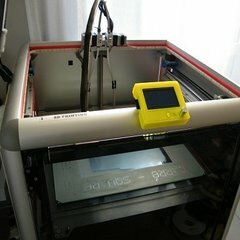 You can also print on a cold table PLA and similar materials. The first layer need not be perfectly adhere to the table and does not need to be closed door. See this picture, these are prints of 50 hours or more without heating the table and printing is constantly on the spot. Ok geen probleem, mensen zijn altijd bang voor nieuwe producten :> Ik betwijfel dat 3Dlack en Pitt gaf een dergelijk effect.